This event will tackle the biggest issues faced by business in creating a net positive impact and ensuring sustainable and resilient agricultural supply chains. 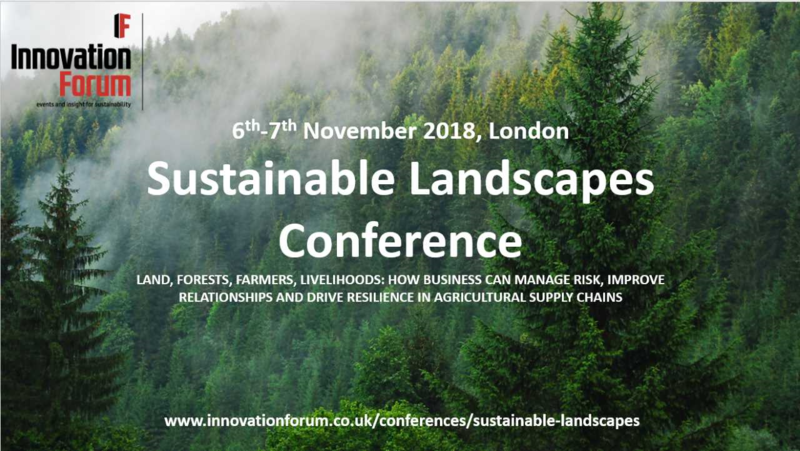 The Innovation Forum’s Sustainable Landscapes Conference will bring together key themes and players from previous events on smallholder farmer resilience, deforestation and sustainable agriculture. The Sustainable Landscapes Conference will tackle the biggest issues faced by business in creating a net positive impact and ensuring sustainable and resilient agricultural supply chains. The conference will focus on five tracks; Land which will highlight leading sustainable agriculture practices and explore initiatives driving climate resilience within supply chains; Forests which will break down the challenges faced in removing deforestation from company supply chains, and look at steps necessary for business to reach 2020 targets; Farmers which will look at the role of the business in building resilience in small supply chains and assess the future of smallholder farming as a viable business model; and Tech and Innovation which will explore the latest innovations and solutions in agri-tech and how these can be leveraged effectively to build sustainable landscapes. WRI’s Charles Barber, Director of the Forest Legality Initiative, will be speaking on a panel titled “Forests: How to tackle illegal deforestation by communities and smallholders” with Mikhail Tarasov the Global Forestry Manager for IKEA and Euan Murray, the Chief Executive Officer at The Sustainability Consortium. The panel will highlight themes related to forest legality and the role of good governance in reducing illegal deforestation.